Skinner Field: should it be improved? OUT OF THE RUNNING—The rubberized track at Skinner Field, once state of the art, is showing some age. The question is, who has the money to repair it? When SSGT Charles Towns comes home to Cedar Springs from Georgia, he runs on the track at Skinner Field—and wonders what will become of it. He was recently upset to hear that the school was seeking a sinking fund millage for school repairs, and there was no mention of repairs for the track at Skinner Field. “I just want to know what their plan for Skinner is,” he said in an email to the Post. On Friday, July 6, 1948, the Village of Cedar Springs paid tribute to Bert Skinner, a leading citizen and businessman. Part of the tribute was the dedication of Cedar Springs Public School’s lighted athletic field, on the west side of Morley Park. In 1991, a gift was given to the school district, to construct a running track at the field. An agreement signed by both the school and city made it available for both school athletic events and the community to run on. It was created partly on school property and partly on city property, with the school district responsible for maintenance for a period of 99 years, or until they relocated the field and running track. PEELING PAINT—The school district only has the budget to do basic maintenance at Skinner Field. That happened in the mid-2000s, when Red Hawk Stadium was approved by the voters as part of a bond issue. 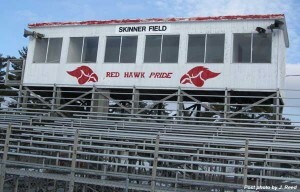 Most school athletic events are now held at Red Hawk Stadium, although the middle school still uses the track at Skinner, as do members of the general public. Red Hawk stadium is not open for the public to run on. Other groups also use Skinner Field, such as Rocket football and semi pro teams. In 2007, the school transferred the last parcel they owned at Skinner Field to the city of Cedar Springs, but the school has continued to do maintenance on the field, such as mowing, trimming, picking up trash, maintaining the turf, watering, and paying the water bill. According to Asst. Superintendent David Cairy, they spend about $10,000 to $15,000 per year on Skinner Field. Neither the city nor the school system, both with shrinking revenues, currently has money budgeted for repairs at Skinner Field. 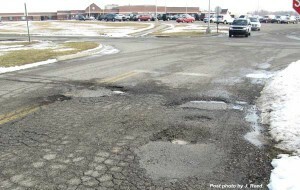 Under the terms of the contract, the school could remove the improvements if the cost to repair exceeded the cost of removal. The visiting side bleachers were removed due to safety issues several years ago. “As a voter I would go with a compromise that would allow them to save up for several years. I do not want to sink the school district, but if their plan for Skinner is not to even be concerned, and just let it fall apart, while they maintain Red Hawk Stadium, I find that unacceptable. The whole community uses that track, and they promised to maintain it,” said Towns. Cairy said that repair of a track is allowable under a sinking fund millage, but they need to look at what their most urgent needs are. He noted that repair of the track could cost as high as $20,000. Emails by Towns to both the school and the city has gotten the two entities to begin discussing what the future of Skinner Field might be. “In the past 10 years we’ve worked pretty closely together, and share many of the same goals,” said Cairy. The two groups plan to meet in the near future to discuss the issue. 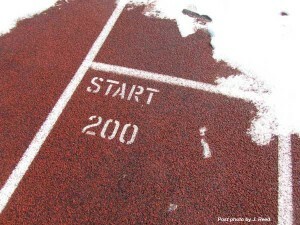 Do you use the track at Skinner Field? Email us and let us know what you think of the issue at news@cedarspringspost.com.